-Blanch the cauliflower pieces by adding them to a pot of well-salted, boiling water for about 30-45 seconds just until crisp-tender; drain, then shock for about 30 seconds in ice-water to cool; drain from ice water and pat dry with paper towel; set aside for a moment. -Set up your breading station by adding the flour into a large ziplock bag, along with a pinch of salt; next, beat the eggs in a large bowl; finally, add the panko, the parmesan, the paprika, pepper and a pinch of salt into another large ziplock bag. -To bread, add the blanched cauliflower pieces to the bag with the flour, and very gently shake to coat the pieces well; next, add the floured pieces to the bowl with the beaten eggs, and toss the pieces to coat with the egg; next, add the pieces to the bag with the panko/parmesan mixture, and again, gently shake to coat the pieces well; take the coated pieces out and place onto a plate to hold. -To fry, heat enough oil to shallow fry (about ½ cup) in a large skillet or pan; once the oil is hot, add about a third or half (depending on size of pan) of the breaded cauliflower pieces in, and allow them to fry for about 5-7 minutes, moving them around occasionally, until crispy and golden-brown on all sides; remove and drain on paper towel, sprinkle with a little salt and pepper if desired, and repeat until all pieces are fried. 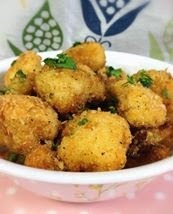 -To serve, allow the “Poppers” to cool slightly, as they will be quite hot when fresh out of the oil; serve alongside the Creamy Buttermilk Ranch Dipping sauce, and garnish with some chopped green onion, if desired. -To a small bowl, add all of the ingredients and whisk/blend until well combined; cover with plastic and refrigerate until ready to serve.